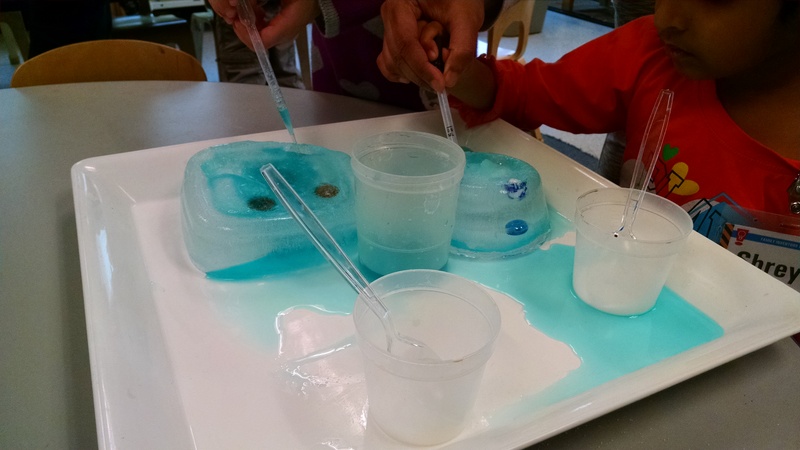 A concept like “states of matter” may seem too abstract to teach to kids 3-7, but there are lots of hands-on ways they can experience the ideas. Once they’ve experienced it, then we just give them the words to describe these things and the concepts to connect the ideas together. So, first, let’s explore the activities where they experience states of matter. This is a really long post… if you go to the bottom, you’ll find more info about how to teach the concepts that explain these experiences. If, like us, you’re teaching one two-hour session on this, there are more ideas in this post than you can do in one class. But, if you see the kids for more days, you could spread these ideas over multiple sessions. Ice melting: We filled plastic containers with water and froze them overnight. In class, we put the ice in a tub. Next to it, we put a dish of coarse salt with a spoon, a container of water with eye droppers, and diluted liquid water colors with pipettes. Kids dribbled on substances to melt the ice. Challenge: Can you Save Captain America? Prep 24+ hours in advance: Fill a loaf pan halfway with water. Freeze it. Fill it the rest of the way with water. Take a Captain America figure, or any other toy, and drop him in – he’ll settle in the middle of the pan. Freeze it the rest of the way. In class, use it like the ice blocks, but kids have the extra motivation of trying to get the toy out of the ice. 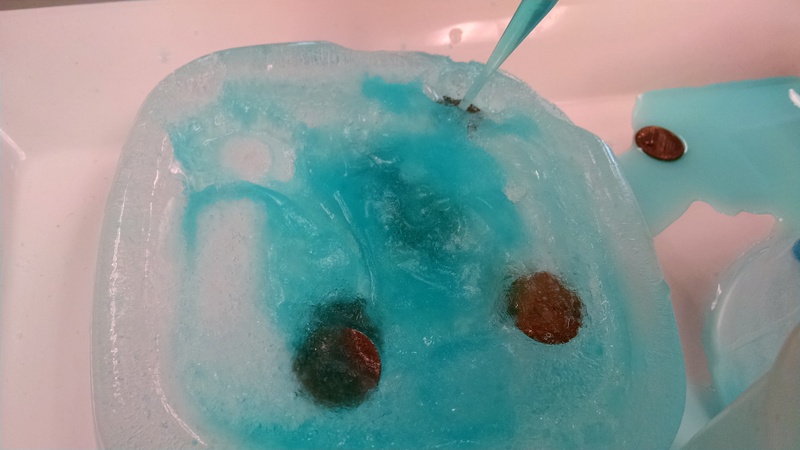 This year, we offered one ice block with plastic dinosaurs to excavate, one with pennies, and one with marbles. I did several layers during the freezing process, so the items were suspended at several levels. In our afternoon class, we had two girls working very hard at excavating pennies and marbles. They were very focused on choosing a penny, then putting water and salt directly over that penny until they broke through the ice and could remove it. Whenever they broke one free, they’d shout out the news and the class would cheer. After kids have worked with the ice and the salt for a while, you could take it up to the next level. You could offer wood mallets and kid-friendly chisels. Or you could offer a hair dryer, but take precautions so it won’t land in the water from the melted ice. In our morning class, two boys were very dedicated to melting the entire block of dinosaur ice with a hair dryer. Cooking Lessons: You could also melt butter or chocolate in a microwave or on a stove. Balloons: Trapping Gas in a Container. Pump and Let Go: We had balloons and Balloon Pumps . Kids could fill the balloons, and let go, and the escaping air (gas) propels the balloon, sputtering around the room. 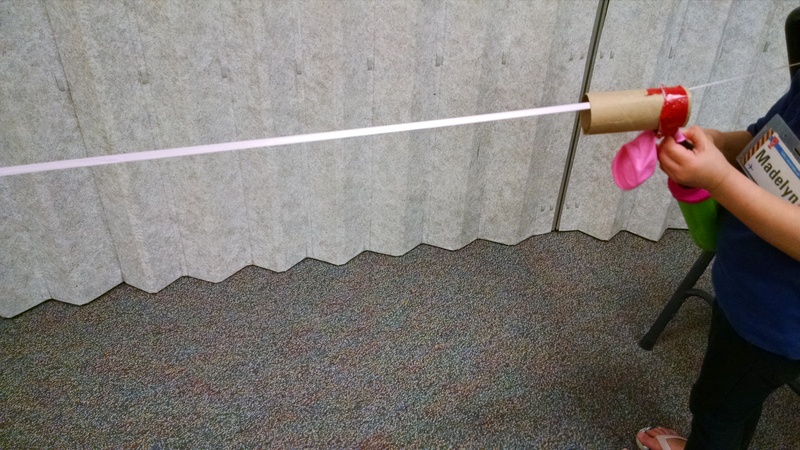 Balloon Rockets: We also set up tracks with balloon rockets: take a toilet paper tube, tape a balloon to it – you need to tape the balloon around the “neck” but you have to tape loosely enough that you’ll then be able to fit the balloon pump into the neck opening. Mount the tube on a string. Then kids use the balloon pump to blow up the balloon. Let go and the balloon flies along the track. 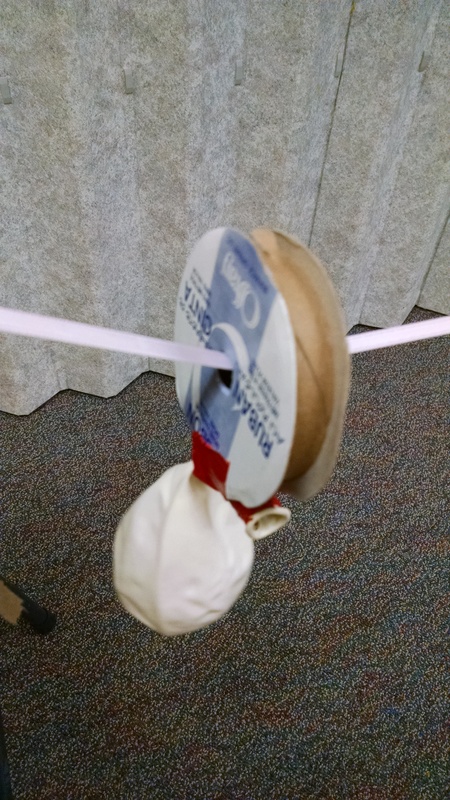 Balloon Spinner: If you mount the balloon on a cardboard ribbon spool instead of a toilet paper roll, then if you inflate and let go, the spool will spin around the ribbon. Trapping Gas in Bubbles: Put out bubble solution and wands for free play. As kids play, you can explain that the bubble solution is a liquid which holds together as we fill it with gas (the air from our lungs). Helium Balloons: You could have helium balloons and balloons you blow up yourself and kids can compare the differences between them. Volume comparison: You could fill the water table with measuring cups and containers in a wide variety of shapes. If they pour exactly one cup of water into each of these shapes, it can look very different – short and flat, or tall and skinny, etc. You could also have solids (e.g. Duplos or plastic counting bears) and they would see that they can’t necessarily fit the same number of bears into each of the containers, because the bears don’t mold to the shape of the vessel. (Note: our three to four year olds totally miss the science behind this experiment, but they still have plenty of fun scooping up plastic bears and floating them in containers of water. 3 gloves. Use latex or non-latex gloves from your first aid kit: hours before class fill one with water and freeze it. 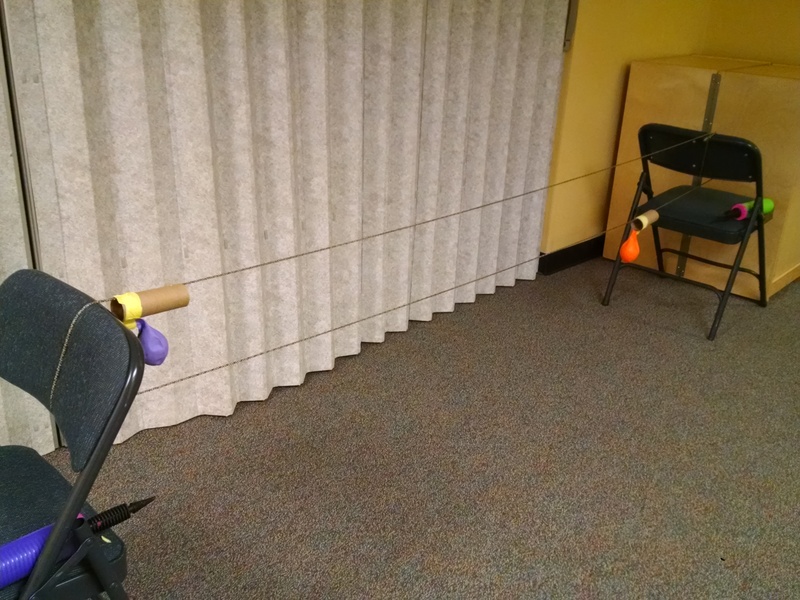 When setting up for class, fill one with water, and blow one up like a balloon and tie it off. Put the three gloves on a table, with signs explaining the three states. Here’s a PDF of the signs I used. Sorting Game: Have children sort things into categories of Solid, Liquid, or Gas. There’s several printable sorting games available online. We used one from Have Fun Teaching. There’s also a good one on Teachers Pay Teachers. You could do physical objects instead: any solids, some containers full of liquids, a balloon full of air, and an “empty” container with an airtight lid (a container of air). If you have older kids, put some “tricky” solids… something soft and flowy like silk fabric, and something like sugar or salt that pours and molds to shape, but is really lots of little solids. 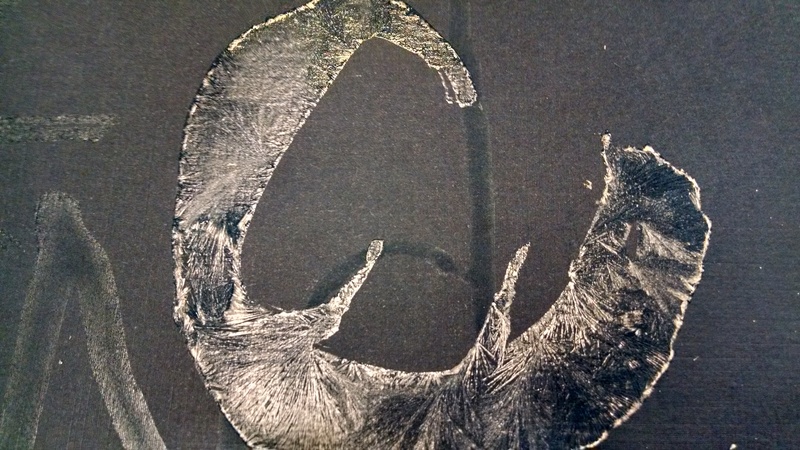 You can use a similar technique to make “crystal paintings” by coloring the salt water, and painting on white paper. I’m thinking that would be a great art project for an Anna and Elsa / Frozen themed birthday party…. print a picture of Arendelle, then paint blue ice crystals all over it. Evaporation experiment: This is a good take-home exercise, or good if you are in the classroom several days a week. Start with a spoonful of salt. Optional: stir in a food coloring or liquid watercolor paint. Then mix in warm water. 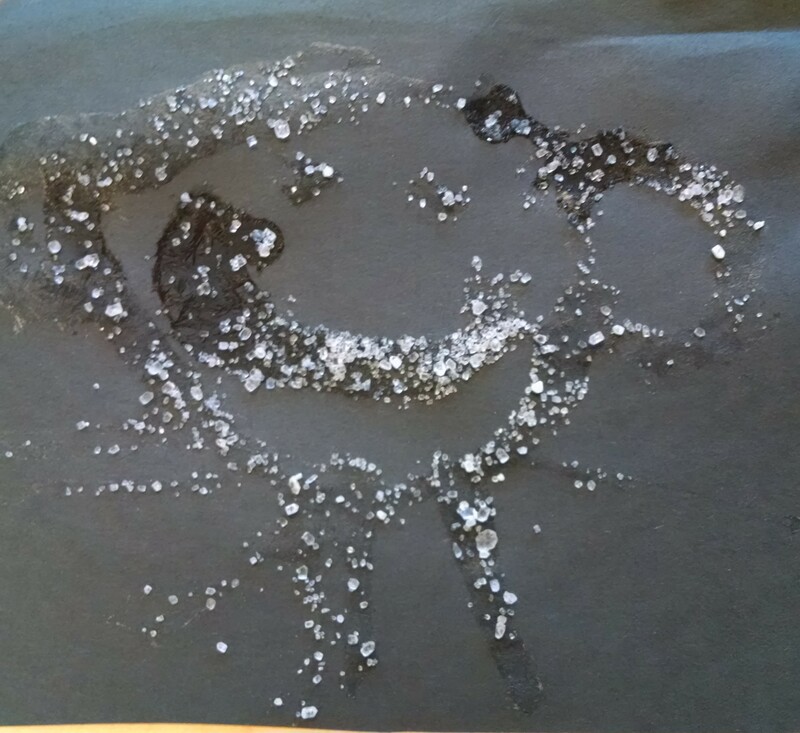 The salt “disappears” as it dissolves in the water. They will then leave the container of liquid on one of the windowsills. 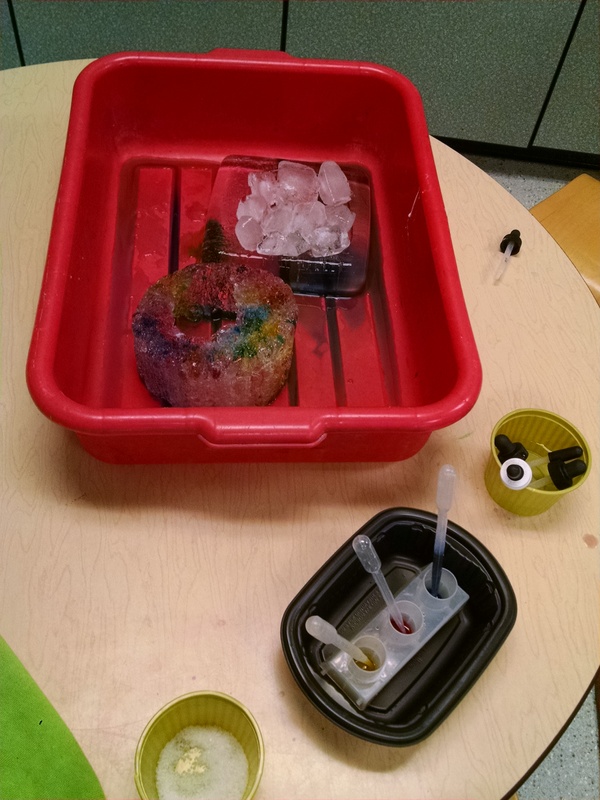 Over the next few days, students can check the container to see if the water evaporated, leaving behind the salt and color. 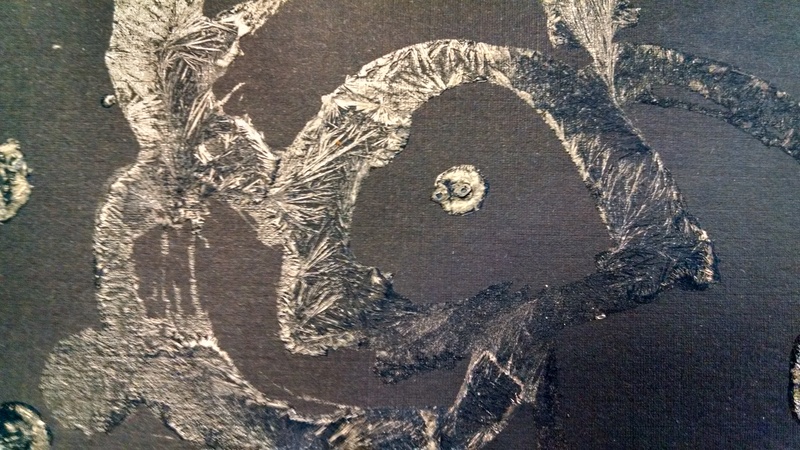 Grow crystals: If you have time, you could make rock candy or Epsom salt crystals. With these experiments, you dissolve a solid into a liquid, then as the liquid evaporates, the solids gather into crystals. Learn how at the Science of Cooking or Kidz World. 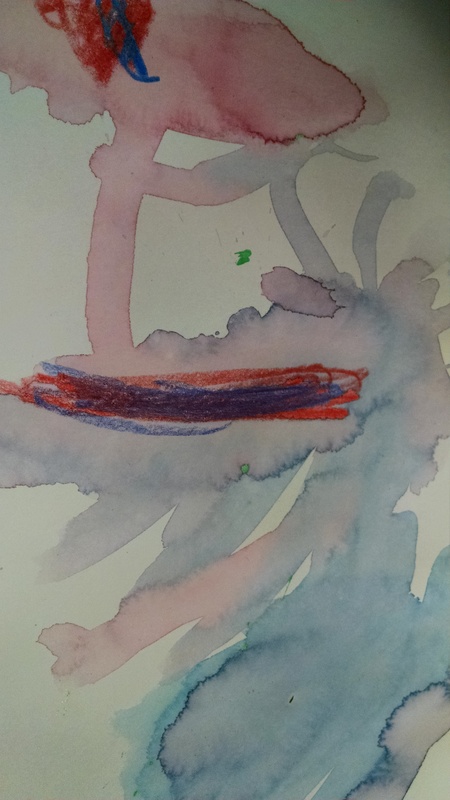 Art – Watercolor resist: We used crayons (a solid) to draw. 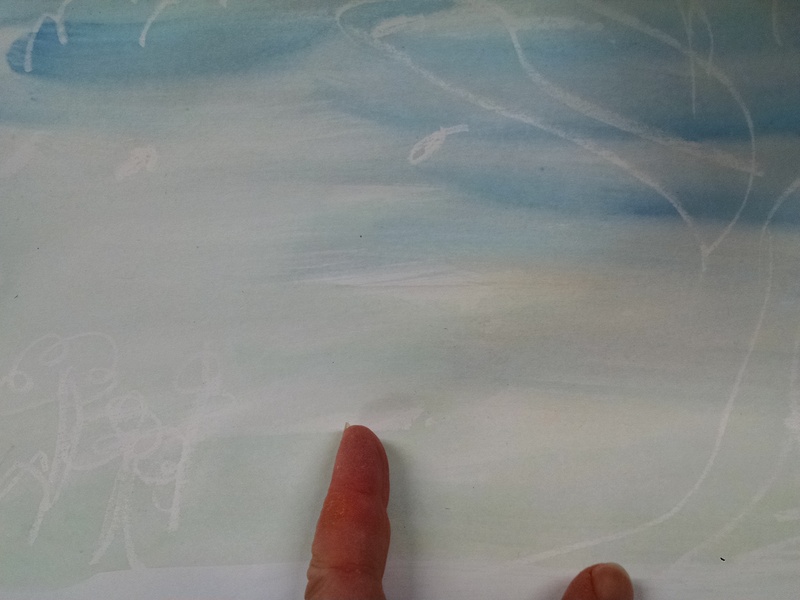 Then painted watercolors (a liquid) on them. 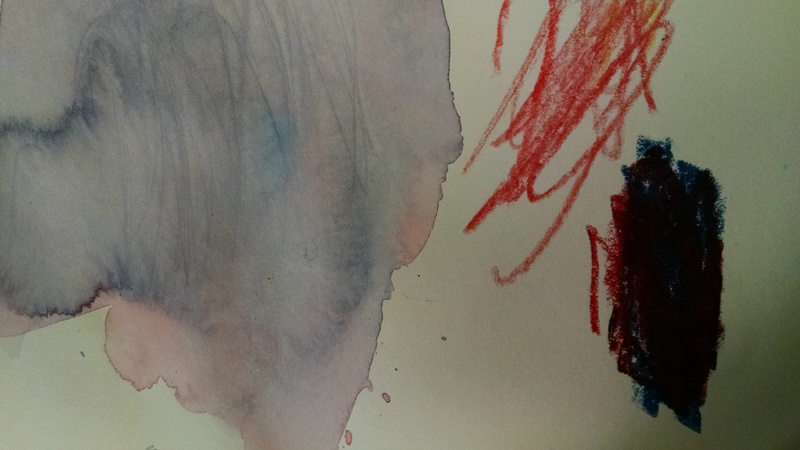 Art Process – Mixing Colors: Have children use liquid colors (e.g. tempera paint or liquid watercolors) and mix colors in a painting – red and yellow make orange. Then have them use solid colors (crayons, pastels or chalk) and try to mix them. Instead of orange, you end up with red scribbles with yellow scribbles laid over the top of them. The solids do not mix as well. Tool of the Week: Thermometers. We always have a tool of the week, and since so much of the states of matter experience is about temperature, we wanted to use thermometers. We filled three containers of water at varying temperatures – ice water, room temperature, and our hottest tap water (120 degrees). We put them in an insulated coffee cup so they would hold temperature as long as possible – the ice water was still filled with ice four hours later! Kids use their fingers to test the water and to guess what is the warmest and what is the coldest, then measure with a thermometer. This experiment worked better for the older kids with a good grasp of numbers (so they actually understand that 72 is warmer than 48). You could place one slower-to-read thermometer in each cup so they could just look at the numbers and read them out (some kid-friendly thermometers for this experiment are the Learning Advantage Thermometers or ETA hand2mind Thermometers) or you could use an instant-read digital thermometer like this one . My instant-read thermometer from my kitchen wasn’t the best option, as it’s not watertight, and the kids tended to submerge it… it survived somehow. Outside time: Last year, it happened to be below freezing the day we had this class. (Not typical for Seattle, even in January.) So, we went outside, and found that lots of the sandbox buckets and scoops were filled with ice. 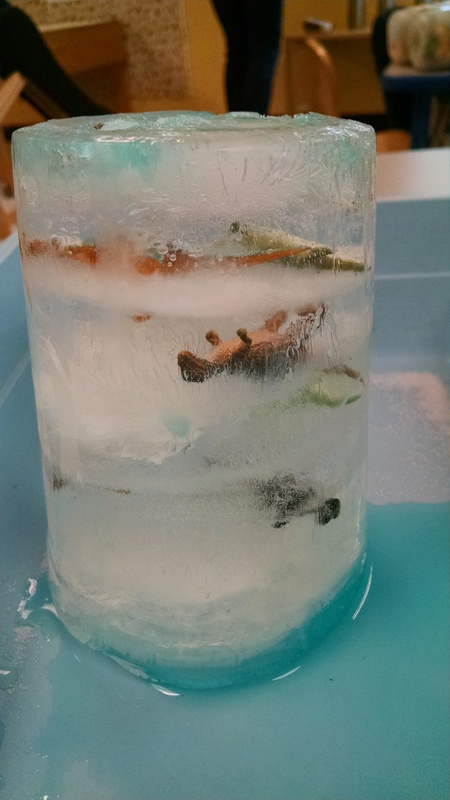 We used warm water to loosen it, broke the ice free, then had fun breaking ice into bits. “Not liquid, not solid” aka “Oobleck” aka “non Newtonian fluid” This involves mixing water and cornstarch. It creates a unique substance. If you pick it up in your hands, you can roll it around quickly and make a solid ball, but when you stop moving your hands, it melts into liquid and dribbles out of your hand. You can stir it slowly like a liquid, but if you smack it with the spoon, it acts like a hard solid. If you make a plastic animal “run” quickly across it, it doesn’t sink in. If you move the animal slowly, it sinks into the “quicksand.” If it moves quickly in a struggle to get out, it stays stuck, but if you pull it out slowly, it breaks free. Learn more at Steve Spangler Science and SciFun. To make it: I used a 16 ounce container of corn starch – I added water a little at a time (Spangler says the ratio is about 10:1 – 10 parts corn starch, 1 water, but I think that’s an error. I think it’s more likely something between 2 parts cornstarch to 1 part water, or 1 part cornstarch to 1 part water). Your goal is to create something that feels like a stiff liquid if you stir slowly, but solidifies when you tap on it. On the Ellen Show, they made a giant vat of this stuff that Ellen DeGeneres runs across. See it at www.youtube.com/watch?v=RUMX_b_m3Js. Another method for ice cream is: Mix 1 cup of whipping cream, 1 cup of half and half, 1 tsp vanilla and ¼ – ½ cup sugar. Put in a small container with an airtight lid. (If it’s not watertight, seal with tape.) Put it inside a bigger round container (like a coffee can.) Fill the large container with layers of ice and rock salt. Roll the can back and forth between students (or up and down a slide) for about 15 minutes till ice cream hardens. Then eat it! Another snack option is a root beer float, which also demos the states of matter. Changing states with heat: have a hot plate, small pot (clear glass would be great), and ice. Show the children the ice, explain that it is water in solid form. Put it in the pot – ask what will happen as you heat it. Show how as it heats, it turns to liquid. Continue to heat. As the steam starts to rise and they can see it, ask them what the steam is – it’s water in gas form (although to be really technical, gas is invisible… what we’re seeing that we call steam is actually tiny suspended drops of water) Ask what would happen if we turn off the heat and let it cool down. Ask what would happen if we put the pot in the freezer. Condensation – gather gas and observe as it changes to liquid: As the water boils, ask the child to watch for steam (gas). 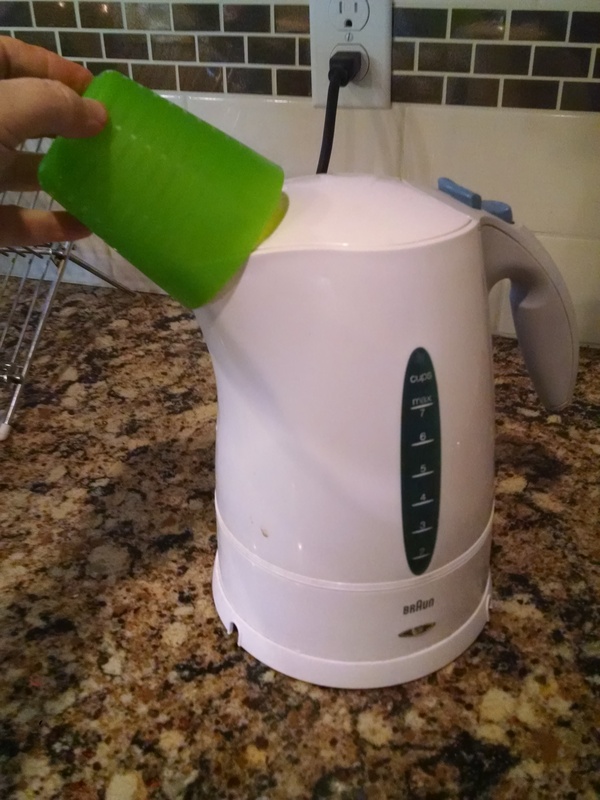 As soon as they see it, hold a clear plastic cup upside down over the spout. (With close supervision!) When the kettle switches off, count to five, then turn the cup over and look inside. What do you see? (Liquid water.) Explain that as the steam cools, it turns back to water. Solid: Pass around a cup with an ice cube in it. Ask them if they know what ice is made of (water). Have them touch the ice. Ask them to describe the ice – it’s cold, it’s hard. Ask if it changes shape if they pour it out of the container into their hand. Show how that it doesn’t change shape. Pick up a few other objects from around the room. Show how you can pick them up and set them down and they stay the same shape. Ask the kids for examples of other solids. Liquid: Then pass around a cup of water. Ask them to describe it – cool, wet, liquid. Pour some from the cup onto a flat dish. Did it change shape? Then pour it into a test tube or other tall skinny container. Did it change shape? Demo a few other liquids: maybe vegetable oil and honey or molasses. You could either leave them in a closed bottle and just show how they move differently, or, you could squeeze out a little and let the kids touch it so they could see how different each of the liquids is. Ask for other examples of liquids. Use a plastic syringe (or pipette) to pull up some water and show them how the syringe has water in it. Then squirt the water back into a container. Gas: Ask if there’s any gas in the room. Tell them the room is full of air, which is a gas. Hold up a plastic syringe and draw it open, filling the cylinder with air. Say “this container is full of something. What’s it full of? (Air) Can you see it?” Push the air out – ask if they saw it come out. Then pull in more air and hold it close to a child’s hand, and blow the air out on their hand – did they feel it? Then fill the syringe with air, hold it under the water, push out the air and ask them what they see – bubbles of air moving through the water. Ask if we can trap a gas, and then blow up a balloon or show them a helium balloon so they can see how the gas is trapped in an airtight container. Book: We read I Get Wet by Vicki Cobb (my new favorite author of science for young children!). It does a nice job of exploring the liquid water and explaining why it makes us wet. We demoed the ideas from it as we went along, pouring water into different shape containers, using a pipette to show how a drop of water forms into a ball and drops, putting water on waxed paper and on a paper towel. 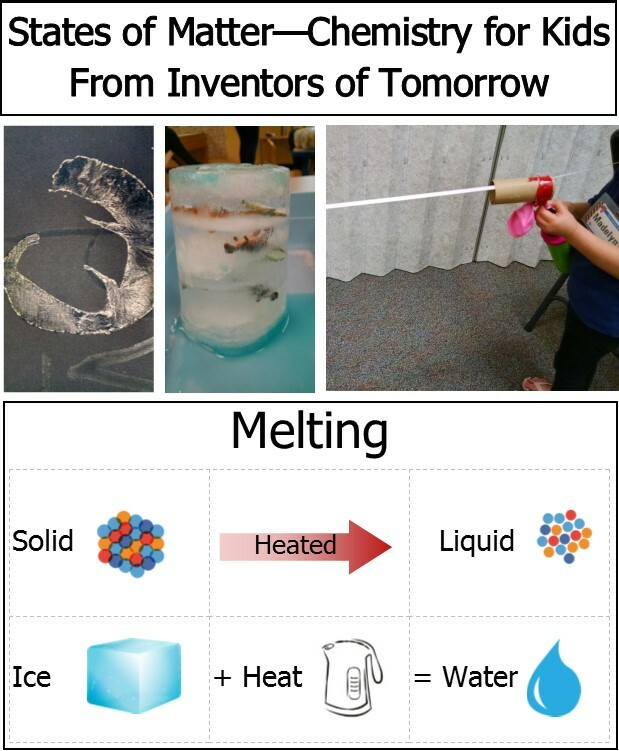 Note: I made up a set of posters which teach the vocabulary of melting, boiling, condensing, and freezing. They’re in this states-of-matter-vocabulary PDF. There’s a different set of worksheets on this at: http://fivejs.com/changes-states-matter-free-printable-worksheets-solid-liquid-gas-plasma/. I used a little of their illustration in making my posters. Matter and Duplo molecules: Talk about matter and how everything that they can see, hear, touch, smell, or taste is made of matter. Explain that matter comes in three forms: solid, liquid, gas. (We’re not going to get into plasma with this age group.) Explain that matter is composed of molecules – very tiny pieces. We reminded them that a few weeks ago, when discussing electricity, we talked about atoms. We explained that molecules were made up of clusters of atoms, but they were still so tiny we can’t see them. We showed them a Duplo and said we would use this as a “model” and pretend it was a molecule of water. Solids: Show a container holding 10 – 15 Duplos, all stuck together. Say these water molecules are all packed tightly together right now – they’re a solid – so we’re pretending that this is water in a solid state – ice. Shake it around in the container a little – see how the solid retains its shape? Pick up a few other solids at random – a book, a marker – whatever you have handy – have the kids notice how you can pick up and move solids and they hold their shape. Show the kids one ice cube. Explain that it’s water in solid form. Put it in an electric kettle (you can cheat and have a little water already in the kettle to make the next step of the demo easier.) Ask what will happen when you heat it. Use a plastic cup to capture some steam. Tip it up, count to 5 and show them what’s inside. Some liquid water will have condensed from the steam. Take your container of loose Duplos and put a lid on it (or seal the bag if you’re using a plastic bag.) You’ve captured some gas. Shake it fast to show how the molecules can’t escape. Then shake it slower, say it’s cooling down, shake it slower, letting all the molecules settle to the bottom of the container – it’s liquid again. Ask what would happen if we put our cup of liquid water in the freezer. It would freeze to solid. Build the Duplos back into a solid mass. Our three to four year olds should get at least some grasp of the three states of water. Over the next few days, try quizzing them about whether something is solid, liquid or gas, and they’ll get it right more times than wrong. This kinesthetic game really reinforced the learning for the kids. Last year, three days after the class, I listened to my then-5-year-old describe states of matter to his preschool teacher. As he described each, he was moving his body just like we did in this game. As a 6 year old, he can repeat back to me what we taught about molecules. This video has a few interactive games as follow-ups: http://www.science4us.com/elementary-physical-science/matter/states-of-matter/. But it doesn’t correct you if you make mistakes… I chose “wet, drippy and melted” as three ways to describe a solid, and it didn’t say that was wrong. Change It! 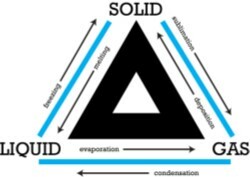 : Solids Liquids Gases and You by Mason. Age 4 – 7. Each state is introduced with a brief description, everyday examples, and a challenge – “can you find three more solid objects in this picture?” There is also a simple activity for each state. (Making play-dough for solids, putting water in different shaped containers for liquids, etc.) Good. Experiments with States of Matter , by Cook. Has good directions for some classic kids’ science experiments, many of which have any direct relation to states of matter: baking soda and vinegar volcano, chromatography, invisible ink, etc.